Protein electrophoresis is a commonly used technique to separate proteins, and is often followed by in-gel staining and/or western analysis to detect the proteins of interest. With a wide variety of applications in proteomics, ranging from protein characterization to protein quantification and applications in other areas such as clinical diagnostics and verification of in vivo and in vitro protein expression, protein electrophoresis and western analysis products are widely used by scientists in academia and industry. Protein electrophoresis and western analysis products represent key opportunities in the life sciences industry as life science suppliers continue improving products and services in this market. 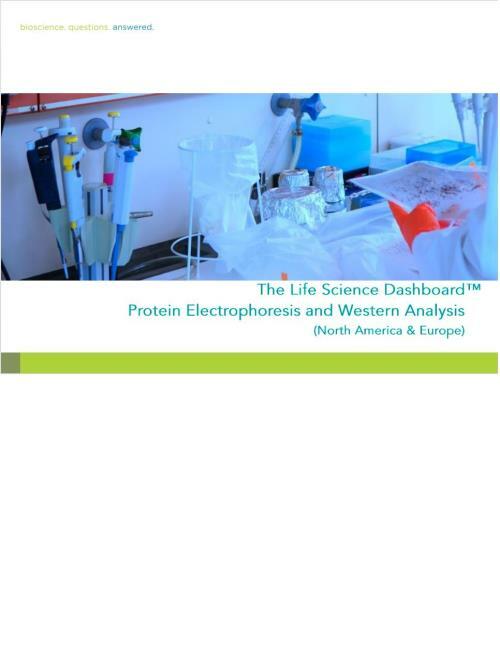 In order to dive more deeply into the characteristics and dynamics of the market for protein electrophoresis and western analysis, the author introduced the Protein Electrophoresis and Western Analysis Dashboard™ (PEW) in January 2012, designed to take a snapshot of the market landscape with the future goal of repeating and publishing the study to give Dashboard readers the ongoing story of how the market is adapting to new products, new competitors and sales and marketing strategies. This report is focused on the use of protein electrophoresis and western analysis products in the life science research market. - Santa Cruz Biotechnology, Inc. Note: Pricing options for Small Companies/Start-up's are available upon enquiry. 2. Dashboard "At A Glance"